To celebrate the Holiday Season, we will publish a blog post every weekday until the Christmas Eve. The December blog series will examine the changing landscape of leadership and management. Various guest writers will bring their expertise to the blog, and we will cover such topics as customer experience, sales, marketing, business intelligence, employee engagement and thought leadership from management point of view. During the last couple of years, I’ve taken part in the workforce survey conducted by the Statistics Finland. What this means is that they’ve asked me a few questions on the phone concerning the workforce in Finland. In return for my answers this year, I received an interesting and nifty booklet titled “Finland in Figures 2014”. The booklet contains a huge amount of figures and graphs that can be used to make fascinating observations. Let’s assume that you work as a sales manager in a macaroni manufacturer in the food industry. In that case you might actually be interested, when your manager tells you that according to the index, the price of groceries and non-alcoholic beverages has increased 17.7 percent since 2010 (booklet p. 3). Your manager also lets you know that at the same time the average price of 400-gram macaroni package has increased 4.9 percent, from 0.41 euros to 0.43 euros (p. 4). Do you feel like you’re being managed here? Is this true leadership in action? Of course not. The act of managing should have consequences. Either you should change your behavior or make a conscious decision to carry on your work in the same way as before. I argue that this hugely significant piece of information didn’t get you to strive for higher macaroni package prices in sales negotiations, and it most likely didn’t encourage you to actively seek new ideas to grow the sales volume of your key accounts. You shouldn’t feel bad for not taking action. You’re just acting like all of us. You’re human. On average, people don’t change their behavior based on knowledge, because that is not the natural way for us to act. How many children will put away their toys immediately after playing with them, if you tell them that the room is messy? Not one of them. he won’t get his bonuses. If the situation would be the other way around, the increase in profits would give the executive a feeling of gratification. The same triggers are now producing positive feelings. Few of us voluntarily seek situations, where you could hurt your own feelings. You need knowledge to understand, which direction you should manage the behaviors. But don’t believe in the illusion that you could actually manage or lead with knowledge. You can only manage and lead people, not things. In order to influence people’s actions, you should first find out, what triggers them to change their behavior and what are the things that make them feel gratified. We constantly work with client projects, in which we use knowledge to understand the current situation of the organization. After seeing the big picture, we advise our clients to manage and lead people by influencing their motivation factors. This can be done with or without technology. According to a number of market analysts, consultancies and technology vendors, Gamification is a rising trend and also entering the world of business. We at Cloudriven share this view. Like with any rising trend, enthusiasm towards gamification can at times be overwhelming. But as with most trends, they have a certain strong and sustainable core – a reason that justifies the existence of the trend. 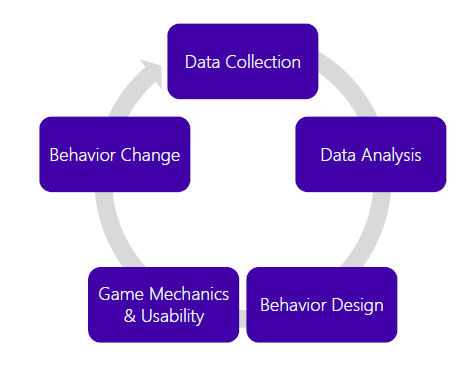 At Cloudriven we believe that using gamification for behavior management is such a core. Creating successful business strategies and goals is often seen easier than executing them. Execution is often linked to behavior. A company can strive to become more service than product oriented, combine two company cultures after a merger, lift employee satisfaction through better management of personnel, obtain more visitors to its website, or increase the effectiveness of its sales or service centre operations. All such goals require certain type of behavior. We are traditionally better at managing behavior in real-life situations. Yet, we believe that the demand for software solutions enabling behavior management is rising. In autumn 2012, Cloudriven decided to aim at creating a software for behavior management. While writing this blog, the first pilot projects are already under way. 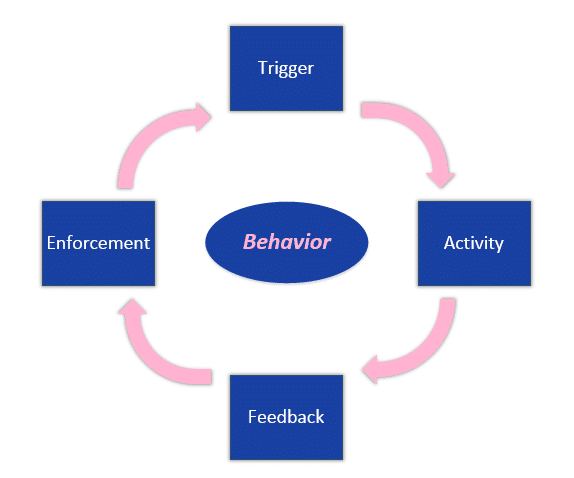 It is therefore a good time to tell a little bit about the concept, and how it supports behavior management. 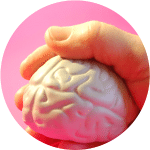 According to Professor BJ Fogg, the most important factor supporting a behavior is Trigger. When a phone rings or traffic lights turn to green, we act. If we do not have the competence or motivation to answer the phone, that should not trouble the software vendor, but through the software we can create or enforce triggers, which should result in a wanted behavior. For instance, can you honestly swear that you’ve never even considered to take a look at the Amazon “the people who bought this also bought…” offers or you’ve completely ignored all your Facebook notifications? A behavior management system must also be able to register the events that indicate a certain behavior (Activity). I called a client, registered a purchase order, had a development discussion with my manager or employee or someone visited our website. It is easier to manage something that is visible. Making behavior visible does not have to result in yet-another-it-system and having to manually input data in it. The system must also be able integrate to existing IT systems and communication tools. People are mostly self-guided, which is a good thing as such, but when the goal is to change behavior in a certain manner, it is a good idea to give instant feedback of behaviors. If one rewards or punishes a dog two hours after the incident, the message will not get across. People are not that sensitive to time, but if the reward of success in spring comes at the company Christmas party, the situation is not optimal. Generally speaking, the faster the feedback, the better the effect. Here one could also think of the ancestors of gamification, entertainment games. Imagine having the chance to select two versions of Angry Birds: one of the versions lets you play the next level right after completing the previous level, in the other version you have to wait for two weeks to play the next level. Which version would you choose to play? Feedback should be given to enforce the wanted behavior. A good behavior management solution supports enforcement both individually and collectively. On the individual level it is important to know what the expectations are and how one is doing in terms of the expectations. In addition, the individual has the right to receive feedback of the performance. Collectively, networking and viral effects should support collective learning and behavior change widely in the organization, e.g. despite geographical distance. What if one of your company’s goals for social media utilisation would be behavior change? The name of our product is Habit. Our goal is to root new behaviors to become habits. We measure the impacts of our service and calculate a ROI to the investment. We believe that companies have the will and need to alter and manage behaviors in psychologically sound ways to help them reach their business goals. Focusing on behavior management gives a chance for both managers and employees to learn more of themselves, each others, their organisation and customers, and in general, lift personnel and customer satisfaction. We’ll tell you more of such successes later in this blog. In case you got interested, let’s be in touch! Gamification has been a hot potato in the technology business for a couple of years. But what is gamification? In 2011 Gartner predicted that by the year 2014 70 percent of Global 2000 organizations will use game elements in their applications. Game elements in business applications can be, for example, diverse scoring systems, leaderboards and ranking lists, progress bars, badges, levels and quests. In turn, Deloitte advices companies to seriously consider, if gamification would be the solution for engaging customers and personnel. 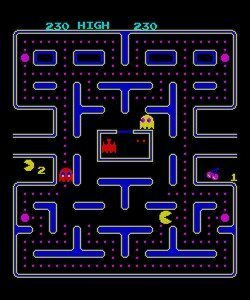 Because gamification is a difficult concept and a tricky word, I thought I’d gather up some definitions of the concept I’ve come across in the web. Lastly, I briefly open up what we at Cloudriven consider gamification to be. We’ll elaborate on our gamification concept in the next blog post. The word gamification was supposedly first used by British coder and inventor Nick Pelling in the year 2002. Pelling’s ideas were still far from what gamification is considered to be today. Pelling used the term gamification to describe how he thought the user-interfaces of electronic devices, such as ATMs and vending machines, should be designed more game-like. He was not that into browser-based web applications; he was more interested in physical equipment and their user interface. In the pre-history of gamification you can also find Bret Terril’s blog post about social games. He mentions gameification [sic] of the web as one interesting subject that had been elaborated in the Social Gaming Summit that year. The biggest or at least the loudest and most influential gamification guru, American Gabe Zichermann has defined gamification as the process of using game thinking and game dynamics to engage audiences and solve problems. Almost the same definition can be found in Wikipedia with the addition that gamification specifically refers to non-game contexts. Deterding, Dixon, Khaled and Nacke elaborate on this approach in their article. From all the different definitions Zichermann’s and Wikipedia’s versions are probably the most commonly used; either as they are or slightly altered. As it is also mentioned in the Oxford’s definition, so far companies have utilized game elements mainly in marketing: customers have been enticed to spend more time with the company’s brand or product with the aid of gamification. A good example is Samsung’s customer loyalty program Samsung Nation where the fans of the brand can collect badges and points, review products, watch videos and see what other fans are doing. The social features found in Facebook and other social media services are important also in gamified applications. Kai Huotari and Juho Hamari define gamification from the service marketing perspective because, as said, most of the gamified implementations aim for marketing benefits. According to them gamification refers to a process of enhancing a service with affordances for gameful experiences in order to support user’s overall value creation. The definition emphasizes the goals of gamification; previously introduced definitions are based on the idea that gamification is all about the game elements. 80 percent of current gamified applications will fail to meet business objectives primarily because of poor design. Gartner’s report from last November bursts the gamification bubble. Gamified applications implemented in novelty and hype don’t usually meet the set business goals. The main reason for failure is poor design: too much focus is put on single features, like badges and points, instead of the user experience as a whole. With mere badges you don’t go far. In addition to extrinsic motivators (badges and points), one should take into consideration the intrinsic motivators like power, autonomy, learning and the sense of meaning (e.g. Amy Kim 2010, s. 12). It helps to get to know the different user types and some behavioral psychology. In fact gamification is a misleading concept because in the end, gamified business applications don’t have much in common with the actual entertainment games. Like Gabe Zichermann and Christopher Cunningham remind us in their book Gamification by Design, the purpose of gamified applications is to increase long-term engagement and customer loyalty. A game in which customer’s or employee’s alter ego hunts down bogeys with an assault rifle in corporate colors is not necessarily the best way to achieve the business goals; even though it might be fun. Gamification is not about turning business into entertainment or a simple game or play. It is about engaging, motivating, training and managing your customers, partners and employees by using familiar game elements. The predecessor of Cloudriven’s Virta was called BLARP (Business Live Action Roleplaying Game). It was the result of New Media company Satama’s and Trainers’ House’s collaboration and originally designed to bring play and creativity into workplaces. The visions were wild as you can see from the advertising video below (sadly only available in Finnish). We were ahead of our time when we six years ago tried to bring gamification to the everyday life and management of organizations. Time wasn’t quite ready then; only a few customers took the gamified features of BLARP into full use. Now gamification is in a strong lift and customers are starting to realize its business benefits. Based on our previous experiences we have a strong lead. We at Cloudriven realize that from business perspective gamification is most of all about changing the behavior of customers, partners and personnel towards the desired direction. The most important method of managing behavior is instant feedback: user must get immediate feedback of his/her actions. Gamification has so far been utilized mostly in marketing, but good examples of activating, engaging and motivating employees also exist. Based on these ideas we are currently developing a game platform that will put your organization’s strategy into practice. With the aid of the gamification platform, management can define what activities are necessary in order to fulfill the strategy and monitor the completion of these activities. Employees, partners and customers can now achieve the set goals because they receive guidance and immediate feedback for their actions. We believe gamification can help organizations to build up customer loyalty and share of wallet and increase significantly the employees’ feeling of inclusion as well as motivation and learning. https://www.cloudriven.fi/wp-content/uploads/2017/03/cloudriven_logo_white300x192-300x192.png 0 0 Janne Haonperä https://www.cloudriven.fi/wp-content/uploads/2017/03/cloudriven_logo_white300x192-300x192.png Janne Haonperä2013-07-10 10:18:442018-10-10 10:36:37What Is Gamification?